Expired Membership? Check status. Renew at the discounted rate of $29.95/year! Login here. Being able to play great defense without fouling (as both a player and a team) is a skill that is often over-looked. 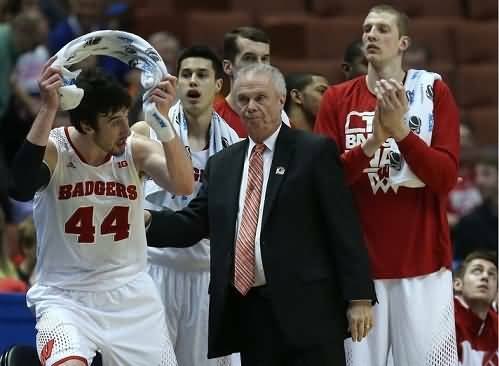 Former Wisconsin Badgers coach Bo Ryan made it a priority and his teams were really good at it, averaging only 12 fouls per game one season! Giving your opponents more free-throws, gives them easy, uncontested points. Free-throws allow the opponent to score without taking any time off the clock. How often do you see a team playing great defense with the shot clock inside 5 seconds, and then someone fouls a penetrating guard - bails him out? Chances are he/she would not have made the shot. It's really amazing how often even good college players miss lay-ups and put-backs right under the basket. Don't help them by fouling. Obvious... you can play the 4th quarter or overtime with your best players, if they are not in foul-trouble. If you have "fouls to give" (not in the 1-and-1), you can defend very aggressively in the last few minutes. If you do foul, the ball has to be inbounded, no free-throws. So you force them to inbound the ball, with a possible chance for a steal or a 5-second call. If they do get the ball in, they have to reset their offense which often eats up a few valuable seconds. So how are we going to turn our bunch of "hackers" into a team that doesn't foul??? You have to make it a priority of teaching your players to play smart and play defense with their feet, not their hands. Coach Bo Ryan was asked recently how to avoid fouling: "Don't leave your feet, don't reach in with your hands."